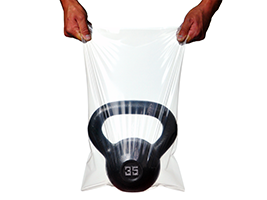 Tuf-R® Linear Low Density Polyethylene (LLDPE) bags provide extra strength and puncture resistance compared to Low Density bags of the same gauge. Because of this, it’s often possible to use a lighter gauge Tuf-R® bag to do the job of a heavier gauge LDPE bag, which saves money and helps to reduce the environmental impact. Tuf-R® bags are made from virgin materials, so they comply with FDA requirements for use in food applications. Gusseted bags feature creased sides that expand to accommodate bulky items.